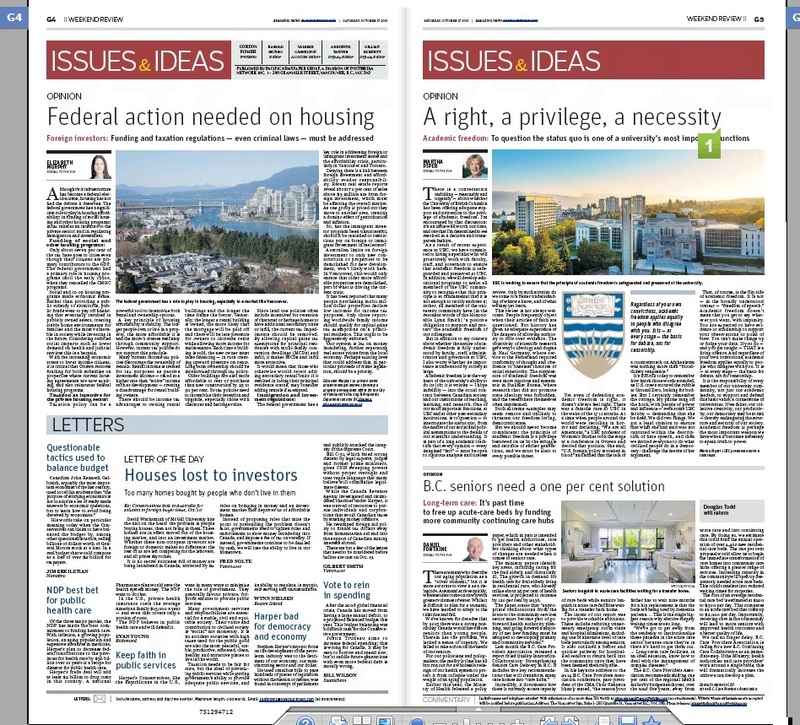 Canadian cities like Vancouver need federal policies to address housing affordability issues. South False Creek includes CMHC subsidized housing from before the federal program was cancelled in the early 1990’s. Although civic infrastructure has become a federal election issue, housing has not had the debate it deserves. The federal government has a significant role to play in housing affordability; in funding of social housing and other housing programs; in tax relief as an incentive to the private sector; and in regulations regarding immigration and investment. Only about 7% of the tax base goes to cities even though their citizens are primary contributors to the GDP. The federal government had a primary role in housing programs until the early 1990’s, at which time they cancelled the CMHC programs. Social and co-op housing programs made economic sense. Rather than providing a public subsidy to slumlords, public funds went to pay off financing that eventually resulted in publicly owned assets. This was an investment in creating stable home environments for families and the most vulnerable in society while investing in the future. When we count the costs of reduced social impacts such as lower demand on health and judicial services there is a bargain. Most importantly, it is the right thing to do. With the increasing economic stress to lower income citizens, it is more important than ever that the federal government restores funding for both subsidies on properties where current housing agreements are now expiring, and also to reinstating federal housing programs. In addition to funding social and co-op housing, CMHC used to give grants to low income earners for upgrades to older housing for health, safety and energy efficiency through the RRAP program. If reinstated, this program would also help in climate change reductions. Taxation policy can be used as a powerful tool to incentivise both rental and ownership housing options. One of the most important principles of housing affordability is stability. The longer people own or live in a property, generally the more affordable it is and the more it creates resiliency through community support. However, current tax policies do not support this principle. Many current income tax policies discourage the ownership of rentals. Rental income is treated for tax purposes as passive investment income so is taxed at a higher rate than is “active” income such as development. This creates a disadvantage to those owners who operate rental buildings over those who hold property for redevelopment. This is the opposite of what should be happening. There should be income tax advantages to owning rental buildings and the longer the time frame the better. Generally, the longer a rental building is owned, the more likely that the mortgage will be paid off and there will be less pressure for owners to increase rents while allowing more income for maintenance. Every time a building is sold, the new owner will need to raise financing to cover the current value of the purchase and that will in turn need to be covered by upward pressure on rents. Therefore, long term ownership should be incentivised through tax policy. Older buildings are also more affordable to rent or purchase than new construction by 25% – 50%. So tax policies should be made to incentivise retention and upgrade of solid older buildings, especially those that have character and heritage value. Since land use policies often include incentives for retention of character or heritage homes to have additional secondary units or infill, the current tax impediments should be removed. By allowing capital gains tax exemptions for principal residences with multi-family conversion dwellings (MCDs) and infill, it makes MCDs and infill more attractive. If up to 3 or 4 units on one site with heritage and character buildings were allowed to qualify for the capital gains tax exemption for principal residence, as long as the owner lives in the main unit and the other units are non-strata family or rentals, then this removes the current tax disincentive for more units. It would not result in a loss of tax revenue. It would mean that those who otherwise would reject adding secondary rental units if it resulted in losing their principal residence status, may consider adding rentals if exempted. This may actually increase tax revenue as otherwise unauthorized units would more likely be declared and their rental income reported. This would be a benefit that is aligned with current civic policies on many fronts: increased rentals, more ground oriented family units, heritage retention, reduction of landfill, and more affordability through mortgage helpers. The federal government controls immigration and investor immigrant policies. 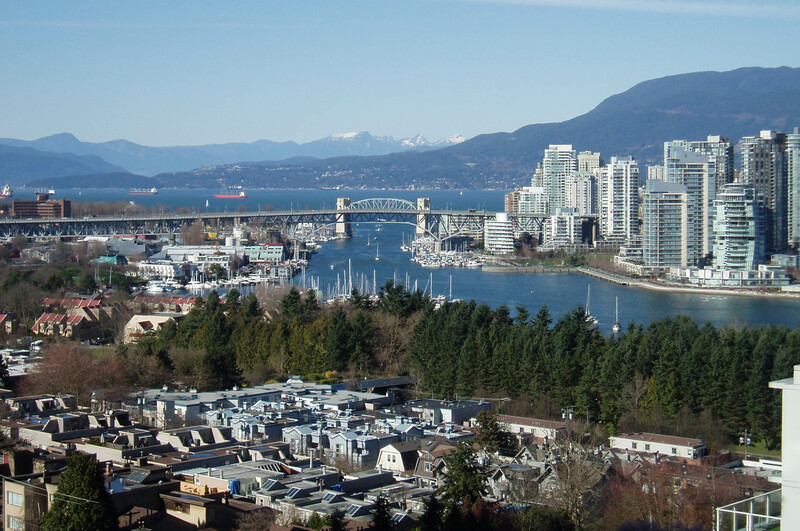 It therefore has a key role in addressing the issues related to foreign or immigrant investment and the affordability crisis, particularly in Vancouver and Toronto. Denying that there is a link between foreign investment and affordability is an evasion of responsibility. The signs are everywhere. Recent reports of the real estate industry admit that about 70% of sales above $3 million are from foreign investment. And this has to be affecting the overall market. As one group is priced out they move to another area that inflates prices across the board. It is creating a domino effect of gentrification and inflation. This raises the question whether the immigrant investor program has been unsuccessful and should be modified or eliminated. Should there be restrictions on foreign or immigrant investment in real estate? The restrictions in Australia, to limit foreign investment to only new construction or properties to be demolished for new development, are not what will likely work here. In Vancouver this would only ensure that the older more affordable properties are demolished, which is part of what is driving the current crisis. It has been reported that many people purchasing multi-million dollar properties only declare very low incomes for income tax purposes. Only those reporting world-wide family income should qualify for capital gains tax exemptions on a principal residence. This ought to be aggressively enforced. Our system is lax on money laundering which is further separating real estate prices from the local economy. There are existing laws that could address this, in particular proceeds of crime legislation (s. 462.3 to 462.49 of The Criminal Code of Canada). Perhaps it is time to make this a priority. Federal immigration policies decide whom and how many they bring into the country. The policies should include increased adequate funding to provincial and local governments that will service the low income new immigrants and refugees who need assistance to settle as productive citizens. While cities struggle under the effects of ongoing affordability issues, the federal government has many tools in its hands and addressing these issues needs to be a commitment of whichever party is elected. This entry was posted in Elizabeth Murphy, Vancouver Sun and tagged Affordable Housing, Character Homes, Community Plans, Elizabeth Murphy, Heritage, Vancouver. Bookmark the permalink.